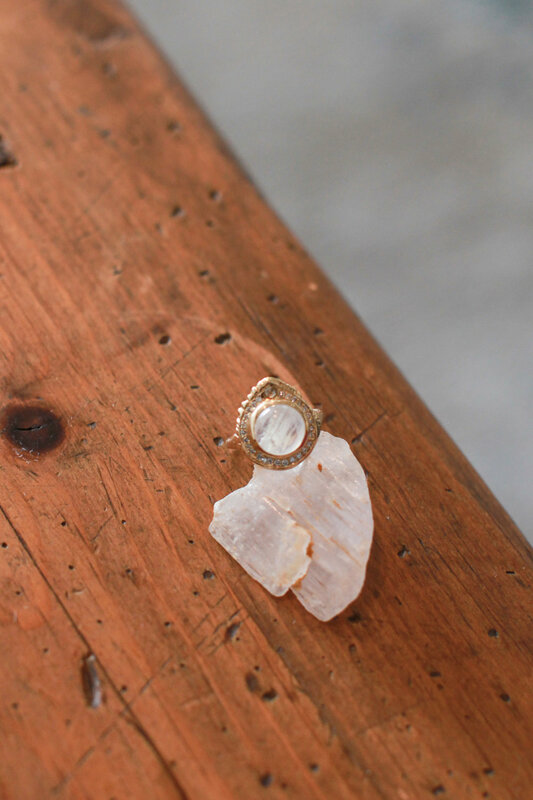 Los Angeles Based Jewelry Designer Shares How She Connects Spirituality and Art. is a digital container featuring inspiring original content and profiles of conscious business owners because we believe that brands can creating a meaningful impact with intention. 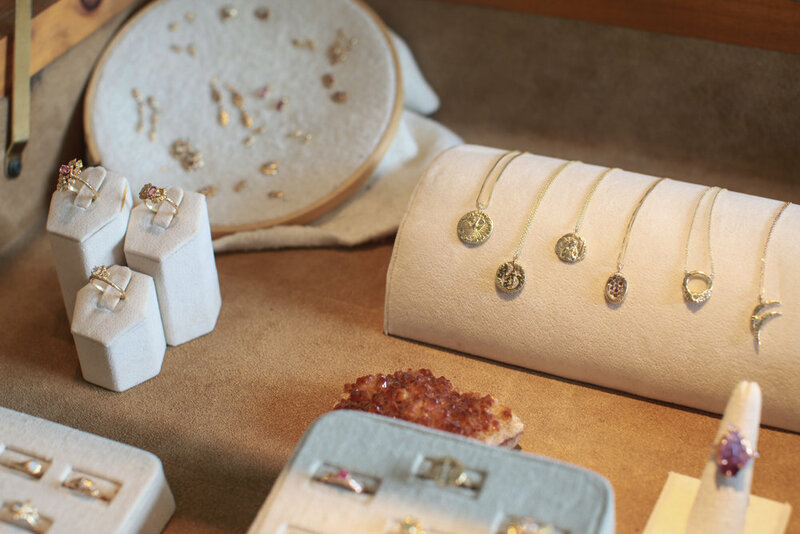 Joy Smith is a Los Angeles based jewelry designer and owner of COMMUNION BY JOY. We first met several years ago when she had a studio in Downtown Los Angeles. In recent years, we have sat in many spiritual ceremonies and women’s gatherings together. Earlier this year, she opened her beautiful showroom and sacred space in Culver City. I’ve already attended several events at her space and so excited to feature her. She is incredibly inspiring beyond being an amazing artist and she shares her journey to becoming a designer, her process, and intention behind her brand name. Can you share about your journey into designing jewelry using the wax carving technique? Joy Smith: I love art and wanted to find a way to express myself and my message through working with my hands. I apprenticed with a jewelry designer in wax carving and that led me on the path to being a jewelry artist. What is the meaning or inspiration behind the name 'Communion'? Joy: The act of sharing one's thoughts and emotions with another or others; intimate converse. My inspiration comes from nature and the mystery behind the veil of life. This is a feeling I try to capture with my designs. When I give my attention to the life around me, inspiration follows. I love ritual and symbolism. I find my inspiration communing with the spirit in nature, animals, and people. I love to make jewelry that carries an energy of inner-strength and contains the power from the design or the stones I set into them. I keep my creative fire going by connecting to people and their stories. "Communion is the act of sharing one's thoughts and emotions with another or others; intimate converse." As a former fashion designer myself, I love how your brand is so unique. Your designs are so authentic and doesn’t emulate trends. I'm sure you get this a lot that all your jewelry pieces are works of art and so beautiful. Can you share and expand on how you get inspired to create each piece? Joy: I have been sculpting jewelry for over 10 years and always loved art since I was a child. I studied some art history in college and dabbled in painting and drawing. My calling for jewelry design came when I worked at an art gallery and realized that I wanted to be the artist. After working in a gallery, I decided it was time to tap into my own artistic side. I started taking lost-wax carving classes at night and I was hooked! I loved the idea of being able to sculpt anything I wanted. I feel my brand empowers strength with feminine elegance. It is modern vintage with a touch of bohemian flair. I had taken art history as an elective in college and loved it. I loved learning how artists were able to express themselves through their work. I thought that art was very healing, not only for the artist, but also for the people who interacted with it. Art is subjective, so the artist is pouring themselves into the art. However you perceive it, there is always some sort of transmuting of energy, and it can be very healing, or it can stir something up inside of them. I wanted to be a part of that. I've been fortunate enough to attend so many beautiful gatherings in your space. When did you decide to open this sacred space and showroom? Joy: I opened up a space for my studio showroom, and I’m having workshops there for empowerment and spirit, and I love that. I love being of service to people in that way. What was the process of moving from your studio in DTLA to your current location in Culver City? Joy: I wanted to be closer to home in Culver City. Can you share more about the song and medicine ceremonies you offer in your space? Joy: I wanted to share my love for ceremony with others and to invite my friends to be a part of it. What advice would you give to someone who is creating for a living through jewelry or other art mediums but want to maintain integrity in scaling their business? Joy: To stay true to their art and be authentic. I admire your authenticity and ability to channel a higher power through your design process. Can you share more about how your creative process is a form of meditation? Joy: I would try to think about how God could protect us, and my relationship to him, giving him all of my troubles. When I graduated from college, I started exploring more about world religions and different spiritualities. That’s when I started working with shamans and healers. When I started working as a jeweler, I would have all of these interesting visions, and my work became a form of meditation for me. In the same way that people do automatic writing, I would do automatic creative work, letting myself be a vessel. I would have the spirit come through me, and I would ask them what they wanted to create through me. And I would create my jewelry. I would get intuitive guidance saying, this is a piece to help someone radiate love; it activates the center of the heart. This piece will help someone with inner strength. So grateful to have met another conscious business owner leading with her nature and intent. Visit the Communion showroom by appointment in Culver City, California and follow Joy on Instagram @communionbyjoy. Photos and interview by Kristine Lo. How to Share Your Authentic Brand Story.